What’s the Best MIG Welder? By the end of this article you’ll have some great models to consider and you’ll understand what you need to look for to make the right purchase. Most DIY welders will be more familiar with arc welders, also known as stick welders. MIG (Metal Inert Gas) welders are most common in industrial settings but many home users can also benefit from this type of welding. Later in the article, we’ll look at a more detailed explanation on MIG welding. For now, let’s just look at a basic comparison between MIG and arc welding, this can help you determine if a MIG welder is worth looking into. Below is a list of benefits for each welding type. Easiest of all welding techniques to learn, making it ideal for novice welders. Perfect for continuous welding. There’s no stopping to change welding rods. Improved control when welding thinner metals. Very clean so there’s no slag to clean afterward. Can weld steel, stainless steel, and aluminum alloys. Some MIG welders can be used for flux cored welding. This means that it can have the same benefits as arc welding. Works better outdoors in windy conditions because gas is not easily blown away. Is able to weld dirty or rusted metal. Can weld steel and stainless steel. More convenient and portable because there’s no need for gas cylinders. So, in general, a MIG welder can be much more beneficial. If you intend welding aluminum alloys, an arc welder won’t do the job, this could be an important deciding factor for some. MIG welders that can be used for flux core welding give you the best of both. These can be used outdoors, weld dirty or rusted metal and work well on thicker materials. After reviewing the best MIG welders which, in our opinion provide you with great value for money, we’ll continue to look at more details about welders, welding, and safety. There’s plenty of good reading for both the novice and experienced welder. Designed and assembled in Troy, OHIO USA. Ideal for : Autobody panels, exhaust systems, mower decks, trailer frames & hitches, tool carts, gun/bow racks, lawn & garden equipment, metal sculpture, PTO attachments, fences. ✓ View or download the MANUAL or the BROCHURE. The Hobart Handler 140 MIG welder is a perfect entry level welder offering exceptional value for money. This is their most popular wire feed model and is MIG ready, meaning that there is no need to obtain any extra kit to perform MIG welding tasks. This welder gives you a great deal of versatility with a 5-postion tapped voltage control selector, giving you a smooth and stable arc on any material thickness. It plugs into a normal 120V socket, making it suitable for the average home user. It draws a peak load of 20A, so check that it is used on a circuit that has a suitable circuit breaker to prevent the power from tripping. It has a current range of 25-140A, with a rated output of 90A at 18.5 VDC and 63A at 21 VDC at a 20% duty cycle. This is a good range for most uses, though if you’re going to be welding steel higher than 16 gauge, I’d recommend a more powerful welder. Wire feed is perfect for all working conditions, at 40 – 700 IPM under load and 50 – 740 IPM with no load. The drive system is all aluminum which is much more durable than the plastic system found on most other wire-feed welders. The quick change drive roll is another great advantage eliminating the need for screw adjustments when changing wire diameters, this allows for the changeover of 0.24” or 0.3”/0.035” solid wire and 0.3/0.035” flux-cored wire. The spool hub is able to accommodate either 4” or 8” spools. It has a 10 FT work cable with a very durable heavy duty clamp. It’s quite a compact piece of equipment and not too heavy either. It weighs 57 LBS with dimensions of Height: 12⅜”; Width: 10⅝”; Depth 19½”. The slanted control panel gives you a good line of sight with easy to read control knobs. It has a polarity changeover switch for switching the feed to negative when required. This is an excellent welder for auto body and household repair jobs and can also be used for a lot of medium to heavy duty repairs, though I wouldn’t recommend it for thicker steel and it is very limited when it comes to aluminum welding where a higher current is required. A cart on wheels is an essential accessory for your welder or plasma cutter. The Hobart 5/3/1 warranty is one of the best. It may seem a little complicated to understand with some components being covered for 5 years, some for 3 years and some for 1 year. Having gone through the warranty in some detail, I’m quite impressed. Heavy duty components like transformers and certain inverter parts are covered for 5 years while most components are covered for 3 years and it’s only really the accessories and the MIG gun that are only covered for 1 year. Excellent value with 230V input power and an output range of 25 to 190 amps. Ideal for: auto body panels, exhaust systems, mower decks, trailer frames & hitches, tool carts, gun/bow racks, lawn & garden equipment, metal sculpture, farm equipment, fences and many other D-I-Y projects. Weld aluminum with the optional SpoolRunner 100 spool gun. Spool gun control circuitry is built-in to the Handler 190 for the optional SpoolRunner 100 direct plug-in spool gun. Alleviates feeding problems with soft aluminum wires. Also useable with mild or stainless steel welding wires. Dual groove drive rolls make it easy to switch from one wire size to another. One knurled groove and one smooth groove for .030-.035 in. (0.8-0.9 mm) wire. If the Hobart Handler 140 is a little limited for the type of welding work you’re doing, the Hobart Handler 190 MIG welder could be a better option. It’s a step up with a current range of 25A to 190A. This gives you a wider range of metal thickness and is better for aluminum welding with a higher duty cycle. At a duty cycle of 30% the welder will deliver 130A at 21.5 VDC – maximum open circuit voltage is 31 VDC. The Handler 190 works well on 24 gauge steel up to 5/16”. The extra power of this welder is made more versatile with a 7 position voltage control switch and infinite wire feed control. This makes it easy to obtain a perfect weld on a wide range of material thickness options with little to no spatter. Wire feed rate is 40 – 700 IPM and 50 – 740 IPM with no load. The built-in wire feeder is easy to use with a quick-release drive roll lever. For smoother wire feed, which is especially useful to eliminate the problems associated with softer aluminum wire. You have the option of using the SpoolRunner direct plugin spool-gun. This is an optional extra with the circuitry already built into the welder. Dual groove drive rolls make switching between wire sizes really easy from 0.3” – 0.035”. Like the smaller Hobart, this one also has a 10 FT work cable and a built-in gas valve, this model also has a dual gauge regulator and gas hose. It has some great safety features too, which include a built-in contactor that cuts the power to the gun when not in use and it has auto-reset thermal overload and motor protection. What may be disappointing for many domestic users is that the Hobart Handler 190 uses a 230 VAC supply and draws a 20.5A current. Though I would expect that if you’re doing the type of welding that requires this kind of power, you will have a workshop with a high amperage 230V circuit. This is not the easiest piece of equipment to move about, as with any welder of this size it’s quite heavy – 68 LBS. Dimensions are Height: 12⅜”; Width: 10⅝”; Depth: 19½”. This is perfect for those who require a heavy duty welder capable of welding thicker pieces and aluminum with a reasonable duty cycle. It has the standard Hobart 5/3/1 warranty as described above. Best MIG Welder for your DIY projects. 7 voltage settings which help fine tune for precision welding. Dual-voltage input (115V/230V) with the MVP plug makes the unit easy to find a place to plug it in. Max 210 Amps output in a small portable case makes transporting to job sites easier and provides power to weld 3/8″ steel. Spool gun control circuitry is built-in to the Handler 210MVP for the optional SpoolRunner 100 direct plug-in spool gun. Alleviates feeding problems with soft aluminum wires. Also useable with mild or stainless steel welding wires. ✓ View or download the MANUAL for the Hobart 210MPV. Wouldn’t it be great to have the versatility of a high current welder and the ability to use it with a regular 120V household power socket? Well, the Hobart 210 MPV offers exactly this. The Multi-Voltage Plug allows it to operate with an 115V or 230V AC power supply, the welder will automatically detect the input voltage. This is great for contractors who do most of their heavy prefabrication work in the workshop where they have a 240V power supply but also need to do installation or repairs on site where they may not have access to a high-volt power circuit. Using a 230V AC supply, you have 7 voltage settings that will provide up to 210A of welding power. Maximum open circuit voltage is 34 VDC. So at a 30% duty cycle, you’ll get 150A at 23 VDC. This provides you enough power to weld ⅜” steel. For these power specs, you’ll require a power outlet providing 230V with a current rating of 24A. When you only have access to household power the machine draws 20A at 115V. Using this voltage you’re obviously limited in terms of the output voltage and current. At 115V there are 4 voltage settings up to a maximum of 28 VDC (open circuit) and a current range of 25A – 140A. At a duty cycle of 20%, the rated output is 90A at 19 VDC. The Hobart 210MPV is essentially a hybrid of the Hobart Handler 140 and the Handler 190. At 115V, it delivers the same output as the Handler 140, though with one less voltage tap setting (4 instead of 5 as on the Handler 140). At 230V, the power is slightly higher than the Handler 190. The wire-feed does not go as high as the other two Hobart welders but is pretty close, 40 – 680 IPM and 60 – 770 IPM with no load. For the rest, the features are exactly the same as the Hobart Handler 190 with the same wire spool, contactor, and thermal protection. It also has circuitry for the SpoolRunner 100 gun and the same gas valve and gauge set-up. The versatility of this welder pushes its weight up slightly to 79 LBS and the dimensions are the same – Height: 12⅜”; Width: 10⅝”; Width: 19½”. The Hobart 210MVP offers outstanding versatility for those who prefer the option of a high-powered 230V welder and the convenience of using it at a lower voltage. As with the other two, it has the 5/3/1 Hobart warranty. One of the best MIG welders for the money due to its value in relation to price. Overall, it’s hits the sweet spot for people who are looking for a professional quality MIG welder. Ultimately, you have to determine your budget and needs before making your final decision. Learn more about the Hobart brand which has been in business since 1917 – over 100 years of experience; and see their full range of products by visiting their site. A powerhouse MIG welder designed for professionals. Diamond Core Technology – Delivers a forgiving arc, excellent out-of-position arc action, low spatter and a wide voltage sweet spot for steel, stainless steel or aluminum. MAXTRAC Cast Aluminum Industrial Wire Drive – Features dual driven rolls, regulated wire feed speed control, brass-to brass connections and Lincoln’s 100% wire supporting split wire guide system. More Output and Better Efficiency – Compare the best in class rated output, wide amperage range and efficiency. Spool Gun Ready – Just remove the standard MIG gun and plug in the economical Magnum® PRO 100SG spool gun for enhanced aluminum wire feeding performance. Coil Claw Cable Management system keeps your work station neat. ✓ View or download the MANUAL or BROCHURE for the Lincoln Electric Power MIG 216. This is a really great industrial strength welder with loads of power and excellent features. They’ve incorporated a system that they call diamond technology which makes for a versatile “forgiving” arc and makes it really simple to use. It also has a durable industrial-strength cast aluminum wire drive. If power is what you’re after, the Lincoln Electric Power MIG 216 has plenty. Seven voltage settings give you perfect fine tuning for any material thickness and the Amp output of 30-250A allows for fantastic duty cycles even on very thick pieces. For a 60% duty cycle, it will deliver 170A at 24 VDC and 216A at 22 VDC for a 30% duty cycle. The split wire guide system provides for both flux-cored and solid wire with a range of 0.35”-0.045” cored wire. The wire feed has a speed range of 50-700 IPM with a well-marked control knob that makes it incredibly easy to get the perfect speed setting. It has a 10 FT power cable and perfect storage with a cable coil hanger on the side of the machine and a hanger that holds the gun neatly in place when stored. In addition to this, it has a compartment at the top to keep all your tips and small accessories neatly packed away and easily accessible. There is also onboard storage for gas cylinders – a very neat and compact unit. It has a gas pipe and regulator kit for argon gas blends. However, if you want to use CO₂ shielding gas, you’ll have to order this gas kit separately. It has an easy-load compartment for the spool that also fits neatly into a closed compartment. Many great features to make working far more efficient. This is a big heavy duty welder that requires a 230V 30A power supply. Of course, a welder of this caliber isn’t going to be light either, it weighs 250 LBS with dimensions of 32.56” X 19.15” X 39.92”. Fortunately, it has four strong wheels to make it easy to move around. There are two large wheels at the back to support most of the weight and two smaller steerable wheels at the front. The Lincoln Electric Power MIG 216 is a seriously built piece of machinery, for the serious workman (or workwoman). I like the excellent storage aspects of its design and its robust quality. The welder comes with a 3-year limited warranty, though there’s quite a long list of items that are limited to 1 year – most importantly the gas regulators. The gun and cable assemblies are limited to a 90-day warranty, I suppose this is because the gun wear will depend a lot on how it is used. The warranty is applicable for industrial use, which is a good thing because it is most likely going to be used in a professional hardworking environment. Magnum PRO 250L gun and 15 ft. (4.5 m) “quick-connect” cable assembly equipped with fixed gas nozzle assembly. This is a fantastic heavy-duty welding machine and easily one of the best MIG welders you can buy. A big step up from traditional consumer MIG welders. Fully adjustable drive system reduces the chance of wire tangling & crushing. Wide 30-180 amp welding output range. MIG weld 24 gauge up to 3/16 in. (4.8 mm) sheet metal in a single pass. Weld up to 1/2 in. (12.7 mm) steel using self-shielded Lincoln Electric Innershield (FCAW-S) wires. ✓ View or download the MANUAL or BROCHURE for the Lincoln Electric EasyMIG 180. This is a nice compact welder that will provide ample power for most household uses and work equally well in a light commercial workshop, provided that you have access to a 230V 20A electrical circuit. It’s both smaller and less sophisticated than the Lincoln Electric K2816-2 but still a very durable piece of equipment with some fantastic features. The Lincoln Electric K2689-1 gives you excellent performance for a machine of this weight and size. It weighs 66 LBS with dimensions of 14” X 10.15” X 18.6”. While reasonably compact and lightweight, it’s able to produce a current of between 30A and 180A. Using a 208V input it will deliver 130A at 17 VDC with a duty cycle of 30%. An AC input voltage of 230V takes this up to 130A at 20 VDC for the same 30% duty cycle. Overall, a nicely put together mid-level MIG welder. The wire feed is adjustable and able to accommodate cored wire sizes from 0.3”-0.045”. Because this wire feed system needs adjusting, it’s not as simple to change between wire sizes, but this is made pretty easy and it really doesn’t take long to adjust the width settings. Wire feed speed is slightly lower and it doesn’t have as much of an adjustment range as the larger Lincoln model. Though it is not too limiting with a speed rate of 50 – 500 IPM. It has a double cast aluminum gearbox for the drive system which not only increases torque but also runs extremely quietly. The welding action is great with a smooth start and low splatter. The arc is also very forgiving so you don’t have problems when your angle or arc gap is not perfect. Like the other Lincoln welder, it’s a very easy welder to operate and even a beginner can accomplish professional looking results. Always wear effective safety gear when working. Don’t skimp on safety. For a general purpose light to medium duty MIG welder, the EasyMIG 180 is a great deal. Easy to use and the build quality is great. It comes with the standard Lincoln 3-year industrial warranty with same limitations as I mentioned with the other Lincoln model. It should be mentioned that Lincoln does offer extended warranty periods of up to nine years in some instances. They are obviously quite confident about the robust quality of their equipment, which does give one a sense of ease when buying their products. Cored Wire Size Range : .030-.045 in. Harris 3000290 Gas Regulator (S25805) and 52 in. (1.3 m) hose (S19303) for use with Ar/CO2 or CO2 gases. For use with CO2 shielding gas, order a Lincoln Electric S19298 CO2 shielding gas bottle adapter. Top Rated & one of the Best MIG Welders for the money. Your money goes further when purchasing a Forney MIG Welder. Great value. ✓ View or download the MANUAL or the BROCHURE for the Forney 309 / 140 MIG. This compact light duty welder is very similar to the 140A Hobart model that we looked into at the beginning of this review. The Forney is slightly cheaper, though not by much and this will also depend on where you buy it. They are so similar that your choice will most probably come down to brand preference or perhaps national pride. The Hobart is made in the US and this one in Italy. Personally, I can’t say which is better or worse – they’re both great little welders for light-duty work. The Forney 309 uses a regular 120V socket, they don’t give an AC amp rating, but I’m pretty sure it will be 20A like most other welders of this size. It has a maximum output current of 140A and voltage is controlled by a four tap setting knob. I also can’t find duty cycle/volts/amps figures for the Forney, though it will be within in the same range as the Hobart Handler 140. Wire feed is controlled by a durable aluminum mechanism with a thumb screw adjustment for solid and flux core wire. Its MIG ready, which really means that the gas regulators are sold separately, it does come with a 10 FT work cable and gas hose with an easy to connect Euro-fit twist fitting. It accommodates either a 4” or 8” spool. Like I said earlier, this welder is very similar to the Hobart 140, right down to the 5/3/1 warranty that has pretty much the same conditions. In fact, the only real difference is that the wire feed on this one requires adjustment when you change wire size. So, in the end, you can save a few dollars buying the Forney if you don’t mind adjusting the wire size when you change spools. Includes a Gas Hose and Regulator. Visit the Forney site to learn more. This is the newly upgraded 2017 model with many great improvements. Much more convenient for long time welding, Release your finger! Ground Cable Quick Connector: The new designed ground cable quick connector makes easy switch between +/-. Full-adjustment: Precision full-adjustment drive system with digital wire speed display reduces the chance of wire tangling and crushing. Suitable for welding stainless steel, mild steel, aluminum, and other metal materials. High quality aluminum wire feeder much more stable and better user experience. The transformer technology has been proven to be reliable and durable. MIG140 can easily connected to your existing 110V wall outlet and can be setup quickly within 10 minutes. ✓ View or download the MANUAL for the Lotos MIG140. The Lotos MIG140 is a very affordable MIG welder and like all the others that we’ve reviewed here, you have the versatility of using flux cored or solid wire. Like most small welders, it can be plugged into a regular 120V 20A power socket making it a good general purpose welder for home users and auto body shops. Made with thermal overload protection system. The most noticeable feature on the Lotus MIG140 are the two LED displays that allow you to see the arc voltage and wire feed rate at a glance. I’m not too sure how much of an advantage this will be, you set your voltage to meet your arc requirements and adjust your wire speed to suit the rate at which you’re going to work at, that’s it. Knowing the exact figures doesn’t really matter, maybe there are some people who might find this feature helpful. It also has a switch that allows you to choose a 2T setting or a 4T setting. The power is in line with any welder of this size, 30A to 140A. On a 20% duty cycle, you’re looking at 90A at 18V DC and a maximum open circuit voltage of 28V DC. The wire feed system is all aluminum and therefore matches the quality standard of the others. The feeder is adjustable to accommodate wire sizes from 0.25”-0.030”. You have the option of a gun for aluminum welding, which is sold separately, though, with a welder of this size, you’re limited to a maximum thickness of ⅛” for aluminum. The Lotos MIG140 is reasonably portable, weighing 54 LBS and the dimensions are Height: 9.6”; Width: 14.5”; Depth: 16”. The brass ground connector has been upgraded from their previous model and gives a good connection. It compares very well to the other 140A welders in this review and there may be some who like the digital display. The Lotos MIG140 has a 1-year warranty. 140 Amp MIG welder with included MIG torch MT104 (10ft long); Ground gable and clamp (9ft long); Argon hose; Argon regulator AR03; Hand shield with cleaning wire brush. MIG welding solid wire (0.8mm, 0.9kg) spool. Very affordable and capable MIG welder that comes with everything you need. If all the other welders that we’ve looked at are above your price range and you’re looking for a simple portable machine for doing small welding tasks, the Campbell Hausfeld WG216001AV is worth taking a look at. It’s small and compact, weighing only 48 LBS and very simple to use, making it perfect for beginners and DIY users who don’t do heavy duty welding. It comes MIG ready, so it has the gas connections if you want to do MIG welding tasks. Straight from the box, it can be used for flux core welding. You have four voltage settings, they call it heat settings but it’s the same as using a 4 tap voltage setting on other welders. Maximum output is 70A, so you’re quite limited with regard to gauge and metal thickness (up to 3/16”). You can forget about attempting to weld aluminum with this welder, it simply doesn’t have the power. At a 20% duty cycle, you get 70A at 18 VDC, with a maximum open circuit voltage of 40V. It has adjustable wire feed, unfortunately, I can’t get figures on speed or wire thickness. Though I wouldn’t think that you’ll be using very thick wire, considering the power limitations of this welder. The general build of the welder looks to be very robust, though the ground clamp looks pretty flimsy. It’s quite easy to fit a new clamp if this one doesn’t hold up to your working conditions. This is a perfect little welder for people who are not looking to do major tasks and the price puts in a range that will appeal to many home users. It comes with a 1-year limited warranty. All of these welders are suitable for both MIG and flux core welding, which means that you can work more easily indoors with gas cylinders and still have the advantage of flux core for outdoor welding. They all use a transformer, unlike some welders that use an inverter. The advantage of transformer welders is that they are very durable, a transformer will very likely last you a lifetime. Inverter welders are beneficial because they draw a lower current and can be used with a portable generator. 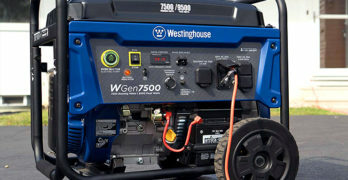 Transformer welders will cause damage to most portable generators. Inverter welders are considerably more expensive to buy and may often require repairs and maintenance to the inverter over time. So, the welders that we’ve reviewed so far offer the best value for money in their class and will last a long time with very little expense on maintenance, if any. What is the difference between MIG and arc welding? Let’s start by looking at the description of each type. Metal Inert Gas Welding (MIG) vs. Gas Metal Arc Welding (GMAW) or Stick Metal Arc Welding (SMAW). This all sounds very scientific and not easy to understand, though it’s not that complicated to explain. Gasses like argon, CO₂ and some others are combined to protect the weld from impurities in the air that can affect the quality of the weld. The type of gas used depends on what metal is being welded. MIG uses an inert gas mixture supplied from a cylinder. This gas is supplied to the welding gun through a pipe and is channeled to the arc to protect the weld. The only disadvantage of this is that the gas is easily blown away if used in a windy environment. A MIG system is very easy to use and you don’t have the common problem of the welding rod sticking like with SMAW welders. GMAW and SMAW use metals in the core of the wire or welding rod (in the case of stick welders). When these metals are heated, they produce the gasses needed to protect the weld. The biggest disadvantage of this system is that the wire or rod needs to be heated in order to activate the gas. This means that you can’t start welding before you’ve generated enough heat to melt the flux metals. Anyone who’s used a stick welder knows how frustrating this can be. You have to run the stick up and down a separate piece of metal that’s connected to the ground clamp to generate an arc that will start the gas reaction and then start welding immediately afterward – before the stick cools down. A second disadvantage is that the burnt metals used to create the gas leave a hard residue that has to be removed from the weld after you’ve finished. This can be quite an arduous task requiring you to chip away at the weld with a hammer and then use a wire brush to remove any remaining debris. There are two advantages GMAW and SMAW. Firstly, the gas is generated at the point of the arc, so there’s much less chance of the gas being blown away. This makes GMAW and SMAW much better for working outdoors. The second advantage is that the heat generated by the flux burning also burns away dirt on the metal so you can weld without cleaning and removing rust or galvanized coatings. With a MIG welder, you have to clean the metal thoroughly and remove any impurities, like rust, or else you won’t get a good weld. There’s a third welding method that we haven’t looked into yet, namely Tungsten Inert Gas (TIG) welding. This is the most versatile type of welding, as it allows you to weld any type of metal. They are more expensive than other welders and more complicated to use. This has made them less popular, particularly among DIY welders. Though it’s worth looking into them because for quite a number of users, they may be the only solution. With MIG, SMAW and GMAW welders, the current used to create the arc is conducted through the wire or welding rod. This means that the welding material serves as the conductor. A TIG welder uses a tungsten tip to create the arc and the wire or welding rod is fed separately. This gives you much greater control over the arc, making TIG welders much better for use on non-ferrous metals like magnesium and aluminum. The improved control of the arc makes TIG welders the only option with many metal types. With other welders, you are limited to steel, stainless steel, and aluminum, whereas a TIG welder can be used for virtually any type of metal including brass and cast iron. A TIG welder is more complicated to use. Firstly, you have to pay greater attention to current settings. The welding technique also differs in that you have to feed the welding wire separately. Not only does this require using both hands but you also have to coordinate the speed at which you move the welding tip in relation to the wire, always keeping the welding material at the correct distance and angle to the arc and metal being welded. Affordable TIG welder for DIY projects. Package includes: TIG torch TT132 (13ft long, 2 pin connection); Stick welding electrode holder (9ft long); Ground cable & clamp (6ft long); Argon hose (4ft long); Argon regulator AR03; Foot pedal FP23 (3 prong connection); user Manual; TIG Torch Accessories similar to model TA01 (includes: 2 pieces of shield cups, 2 collets, 1 collet body and 1 DC Tungsten Electrode. Square wave inverter allows you to choose between DC or AC welding up to 200A. AC gives you accurate control when welding fine aluminum. ✓ View or download the MANUAL for the Lotos TIG200. Another great feature of this welder is the foot pedal control. It does take some getting used to, but when mastered, the pedal gives you a perfect variable control over the arc as you work. The perfect control means a perfect weld with nothing left to chance. It also has a dual voltage input for 110 VAC or 220VAC. The welder will automatically detect the input voltage so you just plug it into the available power source and set to work. It comes with a stick clamp which means it can also be used as a stick welder when you don’t need TIG capabilities. The controls are well placed and easy to read with a LED display for accurate readings. Though the controls aren’t as fine as top grade professional welders. Because it uses an inverter it is much lighter than a transformer welder with the same output. It weighs 58 LBS (dimensions: 28” X 13” X 17”) so it can be carried by one person relatively easily. It also comes with all the accessories that you could possibly need, including a welding helmet. While the Lotos TIG200 may not be in the class as top professional machines, it provides excellent value for money. It will perform excellently for both home and small workshop owners. If you are working in a high precision environment where there’s no room for compromise, you’ll need to spend substantially more. But let’s face it, we’re not going to be welding items for a space shuttle or high-tech military equipment. So for most of us, this will be perfect for all our needs. Of all the general topics that I could discuss about welding, safety is probably the most important. Using any type of machinery or tools poses some form of danger or risk of injury. With most tools, the danger is immediately evident and we are aware of the risk involved. This means that we instinctively avert these dangers. When we use a circular saw, we are aware that the blade can easily cut our fingers off and don’t have to think too much about what to do to avoid this. With a grinder, we see the sparks and know to avoid this. Protects your face, forehead, neck, and ears from weld sparks and spatters. When welding we are aware of the molten metal and therefore we instinctively guard ourselves against this. But the biggest danger with welding is not one that we are totally aware of all the time. I’m talking about UV radiation. The brightness of the light does make us aware that we need to shield our eyes from it, but this is only half of the danger and, even then, we are not always aware as to extent of the damage it does. When I was younger, I was quite cavalier about safety and had to learn the hard way about welding safety. This means that I’m in the perfect position to tell people what not to do. There is no doubt that a welding helmet is essential for to your safety, it protects your eyes from UV damage. Old-timers, like me, will remember the days before auto-adjusting welding helmets. A fixed lens helmet has a piece of UV protected glass that is impossible to see through under normal lighting conditions. This means that you have to flip the lens up to line up your welding tip and then hold your hand steady while you drop the lens with the other hand. If you move the tip of your welding rod or wire even half an inch while lowering the lens, you won’t find the area where you’re supposed to be welding. This is because, with the lens down, you can only see a small area directly around the arc. As a result, many of us would do our tacking with the visor up, exposing our eyes to short periods of UV exposure. Those of us who are particularly impatient would even do short welds without protecting our eyes. These short exposures to UV light might leave one with a headache at the end of the day but the long term damage goes by unnoticed. On one particular occasion, I welded far too many times without lowering the lens and a few hours after I’d finished welding, my eyes swelled shut. I ended up in the emergency room at the hospital that night and had my eyes had to be bandaged closed for several days. Since then I’ve always protected my eyes. Believe me when I say that arc eyes is not something you want to endure. Fortunately, automatic adjusting welding helmets have made things a lot easier. Now we can see what we’re doing with without having to lift the lens. Old school helmets may be much cheaper but they’re not worth it. A good quality automatic adjusting helmet is worth the investment. Leather gloves and safety boots are an obvious safety precaution. You want to protect your hands from touching hot metal and your feet from falling molten metal. But there’s quite a lot more to understand about protective clothing. Just like UV radiation from the sun causes sunburn, UV radiation from welding does the same – only much worse. Again, I was foolish enough to weld without properly covering myself and the results were blisters all over the parts of my body that weren’t protected. Wear long sleeves and long pants. Thicker material is even better, UV radiation is capable of penetrating thinner material. You are going to get hot because welding is a hot job. It may get uncomfortable but severe burns from UV radiation is way worse than discomfort, it’s agonizing. Protecting yourself from UV damage is the most important safety precaution when welding. It not only protects you from short term discomfort or even very painful situations but also prevents long term damage to your eyes and skin. Learn more about MIG welders and other practical information about Gas metal arc welding by visiting Wikipedia.